There are some films that you know from the first frame will be cinematic classics. 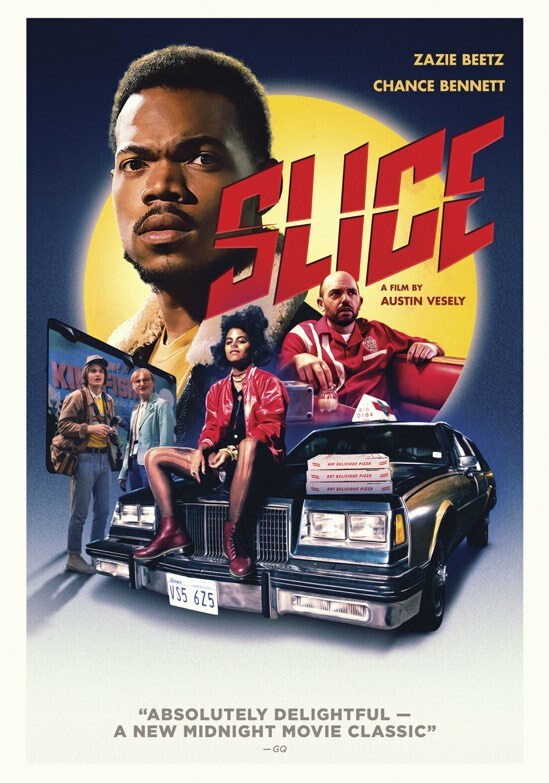 Slice is not one of those, but it is one that will make you laugh and require numerous repeat viewings. Back in my day, we used to call these films "cult classics" and it's certainly worth a mention in the same breath as The Room and The Rocky Horror Picture Show. Slice would be very comfortable playing to a packed house at midnight in an arthouse theater. It would be premature to anoint it a cult classic as those films earn that distinction through the test of time, but it has a head start on its competition. The most dangerous job in Kingfisher is that of a pizza delivery driver. With ghosts, werewolves, and witches lurking about, anytime is the right time for an untimely end. After a string of murders in town, two survivors ban together to unravel the cryptic crime spree. I am, admittedly, late to the part on Zazie Beetz. The young actress has been tearing it up on Atlanta by all accounts and now I can appreciate all of the buzz surrounding her. As a vengeful vigilante in Slice, she is given free rein to showcase both her badass side and her funny bone. She quite literally steals the scene whenever she is onscreen. Her performance here is much like Tessa Thompson's in Sorry to Bother You. I have a feeling that her character wasn't as prolific in the original script, but her performance demanded more screen time for her. Much like Thompson, her career is on a rocket trajectory thanks to this and her star-making turn as Domino in Deadpool 2. While the movie is far from a cinematic masterpiece, it has much of the same sensibilities that have made the Wolfcop movies so entertaining. It's an ultra-low budget take on the The Evil Dead vibe with more comedy thrown in for good measure. It really reminded me of Kevin Smith's Yoga Hosers, which is a movie that I thoroughly enjoyed despite the rather tepid critical response. If you like to kick back, turn off your brain and simply enjoy some craziness, then Slice is right up your alley. Chance the Rapper holds his own in feature film and there are several other familiar faces that pop up with enough regularity that you almost forget that you are watching a B-movie. And don't get me wrong, Slice is a B-movie. In fact, the film celebrates its cheesiness in ways that I haven't seen since the heyday of Troma films. While the production level in Slice is a smidge higher than your average Troma offering, the same ethos persists through them both. Slice is certainly a departure from the same old Hollywood formula and that's a good thing. It's becoming harder and harder to find such quality secondary product that is as entertaining as it refreshing. Slice is a good blend of the two and is now available on DVD.